A tuneful celebration of 19th and 20th century visual artists, offering musical mini-lessons in art appreciation and encouraging listeners to pick up a brush or crayon and try creating art! 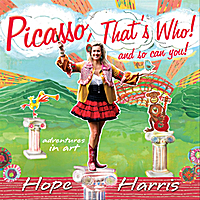 Hot on the heels of her 2011 Parents’ Choice® Silver Honor Award winning CD, Cousins Jamboree, independent children’s musician Hope Harris is excited to embark on a lively new adventure into the world of art with the release of Picasso, That’s Who! (And So Can You!). The album takes kids and families through a tuneful celebration of 19th and 20th century visual artists, offering musical mini-lessons in art appreciation and encouraging listeners to pick up a brush or a crayon and try creating art! Expertly produced by Rob Friedman, co-producer of the Dan Zanes family albums, Picasso, That’s Who! (And So Can You!) invites kids to hop a train with Romare Bearden, action paint like Jackson Pollock, take a line for a walk with Paul Klee, jump off the diving board into a painting by David Hockney, look closely at the petals of a flower like Georgia O’Keeffe, and more. Every one of Hope Harris’ songs is graced with an energy that encourages further artistic exploration in both learning about and creating art. The title track of Picasso, That’s Who! (And So Can You!) is appropriately colored with vibrant Spanish rhythms, melodies, and instruments and asks, “Who as a boy loved to draw? Born in Spain, doodled all that he saw.” A funky retro rock ‘n’ roll ‘60s groove that’s sure to move listeners to action describes the free spirit of Jackson Pollock’s art in sound. Lots of bluegrass pickin’ expresses Grandma Moses, Alexander Calder receives a cool jazz treatment, and Georgia O’Keeffe’s vision is conveyed through a gentle waltz with soothing cello harmonies. Paul Klee’s song, “Dot in Motion,” has a solid roots rock feel, while “Impression Monet” (decorated with the distinctive sound of a French accordion) gives one the feel of floating down the Seine. Songs about David Hockney, Romare Bearden, and Henri Matisse round out the album, each offering a distinctive change of pace. The compelling lyrics to the songs on Picasso, That’s Who! (And So Can You!) will form a large part of the album’s appeal for both families and educators. When Hope Harris sings, “Who changed the world’s point of view/Painting triangles, circles and cubes?/Inventing new ways one could paint as he grew” and then pays tribute to Picasso’s strength of conviction by declaring, “He painted his own way/Didn’t care what they might say/He painted from his heart/Making magic through his art,” she sparks admiration for and curiosity about the artist’s creative spirit and his extraordinary life. In “A-C-T-I-O-N,” Hope declares “I wanna paint like Jackson Pollock/I wanna free color from the line/I wanna paint like Jackson Pollock/I wanna drip it, drizzle, flick it all the time/I’m gonna pour paint straight out of the can/I want A-C-T-I-O-N/I’m gonna throw away the easel/I’m gonna spread the canvas out on the floor/Get in it from all directions/More energy than ever before/I’m gonna make some handprints, mix in sand/I want A-C-T-I-O-N.” Every song on Picasso, That’s Who (And So Can You!) similarly inspires young listeners to create their own art in an original way.